The defending champion began the day nine shots behind overnight leader Jason Dufner on level par. But with his confidence on the rise he birdied the 13th from eight feet, holed a 50-foot bomb on the 17th before chipping in for an incredible birdie three at the 18th for a three under 67 that left him six shots behind Jim Furyk. The American birdied the tough 17th by hitting a hybrid 240 yards to 20 feet and then got up and down for a brave par at the last for a 68 and a one stroke lead over Dufner (71) on nine under with Swedes Henrik Stenson ((69) and Jonas Blixt (66) two and three back respectively. McIlroy’s finish gave him the kind of adrenalin rush he’s been missing almost all season as he almost ended up in a rubbish bin with his drive to the last, punched a 205 yard four iron under trees through the back of the green and then chipped in for a sensational birdie. “I knew they were going to toughen the golf course up today,” said McIlroy, who was tied with Lee Westwood (68) on three under and will partner the Englishman in the fourth last group today. “I sort of thought two 65s would still have a chance, so ten under par could be the target tomorrow. Jim Furyk didn’t get up and down from the bunker at the 15th but made amends with a birdie at the 17th and a par save at the last. Picture: Eoin Clarke www.golffile.ieMcIlroy’s closing birdies came at the two toughest holes on the course - the 509-yard par four 17th and 497 yard 18th - and he reckons they could prove crucial in the long run. He said: “I hit a great drive up 17 and still had 225 to the pin. I hit a good one. I mean, I’m not short. After making four birdies in his last eight holes to make the cut on Friday, McIlroy is having flashbacks of a similar performance to win his first US title in Charlotte three years ago. In 2010 he eagled his last hole to make the cut in the Quail Hollow Championship on the mark, then closed with rounds of 66 and 62 to win by four and become the youngest PGA Tour winner since Tiger Woods. “Every time I’m in that position I just think back to Quail Hollow a few years ago and what I did the weekend there,” McIlroy said. “It gives me a bit confidence knowing that I’ve been in that position before and I’ve been able to win. The Holywood star looked good from the start as he opened with five pars, then birdied the 175-yard sixth from 15 feet. He missed four footer for birdie at the eighth and dropped his only shot of the day at the 10th when he came up short in two and missed from five feet for par. His finish was sensational but it came as no huge surprise to the world No 3, who saw signs that his game was coming around in the WGC-Bridgestone Invitational in Akron, where he finished 27th. “It started last week,” he said. “I had 24 putts for 71 on Friday. Pretty soon I had 25 putts for 69 on Saturday. So my short game has been really, really good. His birdie at the last was spectacular as he ended up near some bins and had to take free relief but still faced a shot from the trees. “I had 175 to the front. So I just tried to keep a four-iron down as much as I could and hit it as hard as I could. 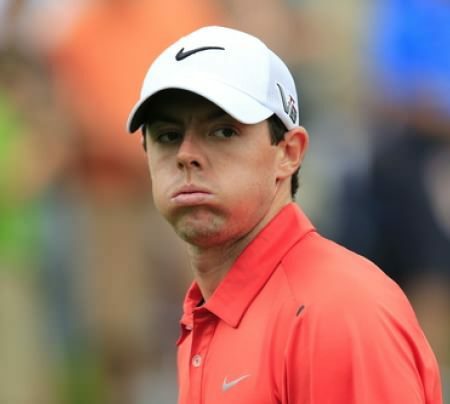 Believing his game is coming back in the nick of time, McIlroy confessed that he is feeling a tingle of excitement again. “Yeah, it’s getting there. It was good to feel the sort of rush again,” he said. “I felt it a bit in San Antonio this year when I was second to Martin Laird. “You know, I had a good chance to win there, and I holed some pretty good putts coming down the stretch which didn’t matter the end. It was great. It was great to feel that. Seven under for his last 25 holes, he added: “To play like that on this golf course and do what I needed to do yesterday just to make the cut, and then to go out and play the way I did today, yeah, I mean, it’s been a good stretch of holes. ONLY OTHER TIME IN THE LEAD: Only once before has Jim Furyk been at the top of the leaderboard after a PGA Championship round. In the opening round of the 2002 PGA Championship at Hazeltine National Golf Club, Furyk shot 68 to share the lead with Fred Funk. 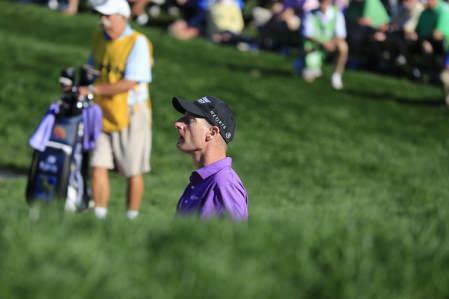 Furyk finished tied for ninth place in that Championship. WHEN IN THE LEAD AFTER THREE ROUNDS: In the 55 previous PGA Championships played under the stroke-play format, a player who led or shared the lead after three rounds has gone on to win the Championship 31 times. Of those 31, six times the eventual Champion shared the lead after 54 holes. In the past five PGA Championships, only Rory McIlroy (in 2012) went on to win after either leading alone or sharing the lead after three rounds. TEE TIMES SET FOR SUNDAY: The first tee time tomorrow is 8:25 a.m., with the final twosome of Jim Furyk and Jason Dufner teeing off on No. 1 at 2:55 p.m.
DUFNER SOLID ON APPROACH: Jason Dufner has hit 43 of 54 Greens in Regulation over the three rounds, a 79.63 percentage, which ties him for first in that category. TAKING OAK HILL HOME: When Jason Dufner leaves Rochester, he will be taking a piece of Oak Hill back home. Dufner, who admits he is a bit of a golf historian, will be traveling with a handful of acorns he and his wife, Amanda, from the grounds at Oak Hill. With a little help, Dufner is hoping that the acorns will mature into oak trees on his land in Auburn, Ala.
McILROY IN DEFENSE MODE: For the second consecutive day, Rory McIlroy saved his best for the end of the round, which means the defending PGA Champion is in the hunt with one round to go. On Friday, McIlroy birdied Nos. 7 and 8 (his 16th and 17th of the round) for a 1-over-par 71. Then today, he birdied No. 17 and chipped in for another birdie at 18, for a 3-under 67. McIlroy is tied for seventh at 3-under par for the Championship. He needed just 25 putts, the fewest of any round for him. ROUND OF THE DAY AND BIGGEST JUMP: Dustin Johnson went from just making the cut yesterday to being among the top 12 in the field at the end of the round today. That’s because Johnson made six birdies and shot 5-under-par 65 today to leap 51 places. Twelve shots out of the lead at the start of the day, Johnson is now seven strokes back and tied for ninth, at 2-under par. GOING THE OTHER WAY: While Johnson was bypassing many in the field, Hunter Mahan took the biggest tumble. Starting his round at 2-under par, Mahan had two double bogeys and six bogeys to shoot 78 today. He fell 48 spots and is tied for 63rd place, at 6-over par. NOT PHIL’S DAY: The 78 that Phil Mickelson shot today ties his highest single-round score in the PGA Championship. He also shot 78 in the third rounds of both the 2002 PGA Championship at Hazeltine National Golf and in 1998 at Sahalee Country Club. TIGER 0 FOR 7: Including the 2003 PGA Championship, Tiger Woods has not broken par in any PGA Championship round at Oak Hill. The even-par 70 that he shot on Friday is his best score at Oak Hill. I’VE SEEN YOU BEFORE: Four-time PGA Champion Tiger Woods and 2010 PGA Champion Keegan Bradley were in the same grouping in the first two rounds and they were paired together today after each finished 36 holes at 1-over par. While Woods shot 73 today and is 4-over par for the Championship, Bradley was one shot better. His 72 puts Bradley at 3-over par and tied for 38th place. McILROY TOPS AMONG PGA CHAMPIONS: Seven PGA Champions made the 36-hole cut, and after today’s play, Rory McIlroy is the best of the bunch. By shooting 3-under-par 67 in the third round, the defending PGA Champion is tied for seventh place, at 3-under par for the Championship. David Toms (2001) is the only other PGA Champion under par – his 69 today has Toms tied for 12th place, at 1-under par. TOUGHEST, EASIEST HOLES TODAY: As was the case in each of the first two rounds, the par-4 17th continued to be the most difficult hole on the course. Today, the par-5 13th played as the easiest hole on the course. McIlroy insists he's "getting there"
Rory McIlroy speaks during his press conference at Oak Hill on Monday. Rory McIlroy insists his current “slump” is nothing compared to last year’s early season struggles and reckons his game is close to clicking into place in time to challenge for a third major win in next week’s US Open at Merion. Rory McIlroy was relieved and excited by his performace at Oak Hill.Rory McIlroy refused to throw in the towel, keeping his US PGA hopes alive and re-booting his season with a gutsy finish at a soggy Oak Hill.